Lady Mary’s service to Cornwall as Lord Lieutenant has been truly remarkable. I have met Lady Mary several times and on each occasion I have been impressed with her zeal and her true love of Cornwall. 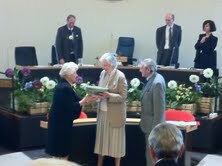 For 17 years Lady Mary with massive support from her husband Jeffrey has worked tirelessly for Cornwall. Often raising issues that need to be addressed without getting involved in politics. This is a rare skill, which has earned her huge respect. At yesterday’s Cornwall Council meeting a presentation was made by the Chairman of Cornwall Council on behalf of Cornwall to say thank you for the hard work and enjoy your retirement. All the political leaders of the council spoke in high praise of Lady Mary’s work and on several occasions she received an standing ovation.